Campbelltown Billabong makes our list but will it be in yours? 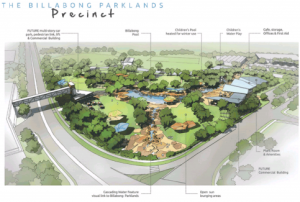 Artist’s impression of Campbelltown Billabong and parklands. After driving for almost five hours what a joy it was to see a sign with “Campbelltown exit – 1 km’’ on it. It always feels good to be home after being absent for some time. Lesson: you appreciate something a lot more when you part from it now and again. Or, holidays are good, but even better when they’re over and you can return to the place you belong. And then some of you may just think, the poor fellow, he’s had a long year or something. Well, maybe, but a little bit of reflection around this time of the year is no bad thing. Apart from anything else it’s a tool for recalling some of the things that happened in the past 12 months – not necessarily as simple as you’d think. During our long drive home we played that old game, what were your highlights of this year. Initially we both drew blanks but the births of grandchildren number nine and 10 were finally recalled, as was a little trip north to Queensland. Of course the country changed Prime Ministers around the same time, but we were trying to recall things that are important. Number 1. 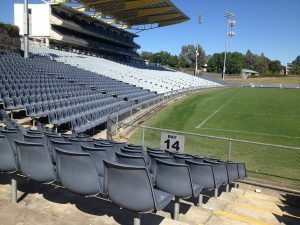 By a country mile, Macarthur getting an A-League licence, which means we will have our own football team playing all their home games out of Campbelltown Stadium (pictured at left) from the 2020-21 season. Hooray! Number 2. The plans for our very own giant swimming hole at Bradbury Oval, the Campbelltown Billabong. Number 3. The realization, finally, that maybe we’re growing a bit too fast and we should slow down just a tad. Number 4. Back on sport, NSW beating Queensland in State of Origin. Number 5. Slowly but surely making Campbelltown one of the truly inclusive places. More to do but much progress achieved in 2018. Well done to all involved in such a noble cause.